It’s been a while since Samsung Galaxy S7 and S7 Edge users started receiving the update to Android 7.0 Nougat over the air. When the OS started rolling out, it first hit the units that were part of the beta program. More than six weeks down the line, the update has yet to hit all Samsung Galaxy S7 and S7 Edge handsets in the U.S. Over the past two or so months, carrier versions of the duo have been receiving the Nougat treat, but the case has been quite opposite for those using the unlocked models. Usually, major software updates start rolling out to unlocked models of phones. But we’ve seen some changes with Android 7.0 Nougat, with the likes of Moto Z Droid and Moto Z Force Droid as well as Sammy’s Galaxy S7 and S7 Edge leading the unlocked models of the same phones in receiving the Nougat treat. But the wait is finally over for Samsung fans. If you own an unlocked Samsung Galaxy S7 Edge, you can now grab the latest update to Android 7.0 Nougat via Samsung’s Smart Switch application. So far, there’s still no word on when the standard Galaxy S7 will be receiving the same treat. In addition, the update is not yet available over the air, but it should be sooner than later. 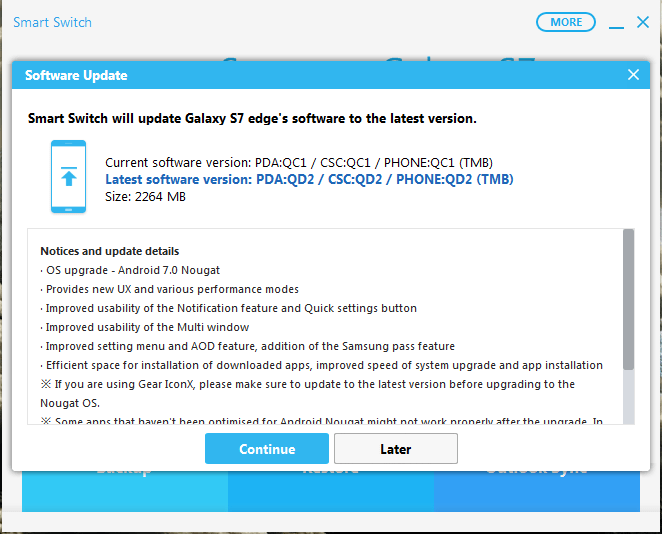 In order to download and install the latest Android 7.0 Nougat on your unlocked Samsung Galaxy S7 Edge, all you need is to install the Smart Switch app on your PC, connect the phone to the PC and follow the instructions that show up. This will let you install the new OS, which comes in weighing a massive 2264MB. The update, which carries build number G935UUEU4BQD2, also comes with last month’s Android security patch. As noted earlier, this update has yet to hit the OTA channel and is just available for the Galaxy S7 Edge.